Where are you going in life? Have you lost your way? Sometimes we can feel as if we are at sea, drifting through life without direction. We tried to do everything right, but it hasn’t worked out as expected. Perhaps we even achieved important goals but then found them unsatisfying or not worth the cost. Or an unexpected loss wrought havoc on our carefully laid plans. Are you searching for life’s meaning and path, or feeling uprooted from home, family, marriage, or job? Passport 2 Purpose provides no answers, because that would imply there is only one set of answers that suits everyone. We believe that what you are searching for was always there, inside you, and that only you can find your personal answers. There is no easy recipe to follow. It will take time and introspection to uncover exactly who you are and were meant to become. 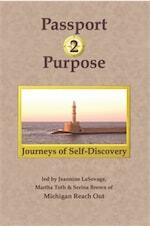 Our book is a journal of self-exploration that will become the guidebook for the rest of your life’s journey. We believe that every person is unique, precious, worthy, and has a destiny. Find yours! The authors spent decades designing and managing mentoring programs for community, university, and non-profit organizations. In doing this, they learned that life and career planning is impossible without first discovering who you are-and want to become. They distill their most effective training workshops for both adults and children, sharing expertise developed through interaction with thousands of people of all ages and backgrounds.